Are Disembodied Sounds Better Evidence than EVP? Some paranormal investigators will use headphones to monitor EVP sessions. They believe that EVP can be heard when it is captured on audio recording devices. I used to believe this as well until I realized that EVP was imprinted phenomena which we covered in article #2. Paranormal sounds or voices that occur live or in real time can be classified as disembodied type phenomena. Headphones are a great tool to use to identify this type of event during investigations. However, paranormal investigators believe they are intercepting EVP when in actuality they are probably hearing disembodied voices or sounds. I stopped using headphones during controlled EVP sessions when almost every sound I heard turned out to be very common noises occurring naturally. It can throw off your focus and concentration during an investigation. Paranormal footsteps are a common type of disembodied sound. Many people have heard ghostly footsteps that have no explanation to their origin. However, you must be sure that the phenomena is paranormal and not someone making those sounds. 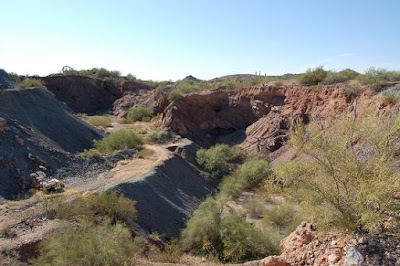 A few years ago I was preparing to teach a class in EVP to several students at the Vulture Mine near Wickenburg, Arizona. The Vulture Mine was once the largest producing gold mine in the state but was closed down during the Second World War. 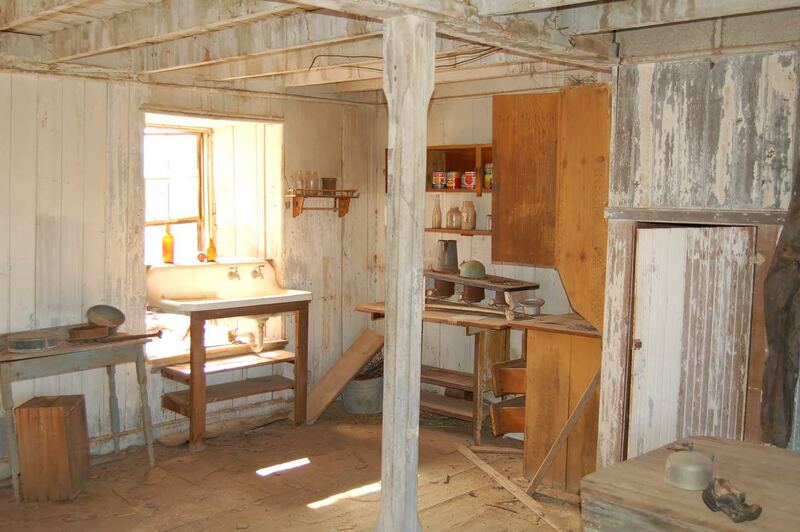 It was eventually sold to private owners who allowed the public to visit the 1.5 mile property and tour the old, dilapidated buildings for a small fee. Assay House: This is where the gold was stored. Armed guards lost their lives protecting it from attacks from Apaches and bandits. This is the largest building on site. 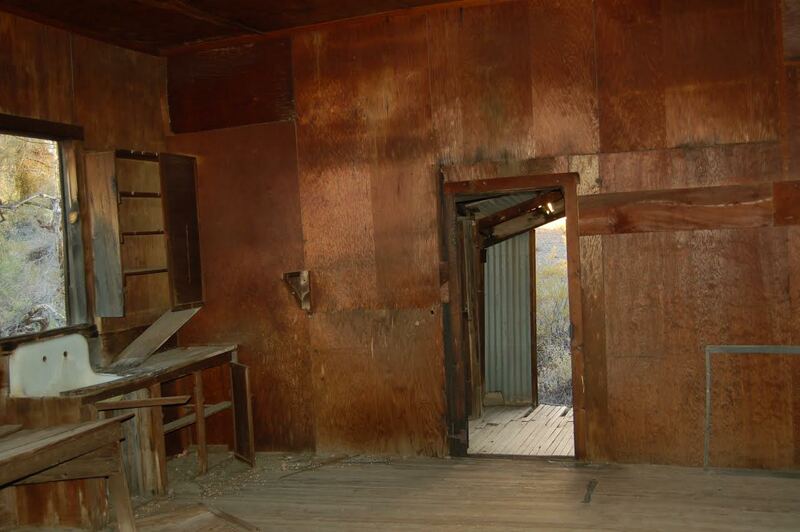 Glory Hole: In 1923, 7 men and 12 burros were killed while chipping away gold from support beams in the shaft at the Vulture Mine. This area was aptly given the name “The Glory Hole” since these thieves went to their glory that day. Their bodies have never been recovered and mining operations have now resumed in this location. 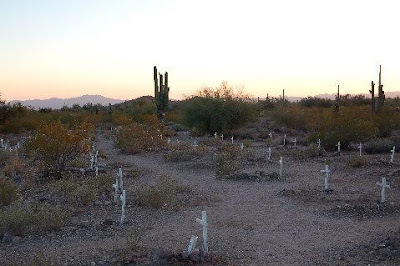 Cemetery: This is the small cemetery located just down the road from the Vulture mine. Many of the graves are those of children who passed away during the horrific influenza outbreak of 1918. Our group was conducting training that day followed by a night time training investigation to show students what we did in the field of paranormal investigation. The caretaker of the property decided to give a short history lecture about the mine to the students near the main entrance about a quarter of a mile away from where I was. I decided to stay behind and watch our equipment located inside the old schoolhouse, a building always rumored to be very haunted. It was late afternoon and very warm that day when I decided to conduct a quick EVP session to pass time. I was about three minutes into the EVP session when loud footsteps sounded and walked past me to the left from behind me and out the back door. As you can see from the photo below, the building had no doors or windows intact. An A- framed roof torn in several areas with an old creaky wooden floor added to the haunted atmosphere of the structure. The building had no attic, basement, or second floor. Outside schoolhouse: I was standing near the middle of the building when this disembodied event happened. This is a photograph of exactly where I was standing. You will hear me ask for the two raps on the wall and what I got was four very loud footsteps to me left that went out the back door. These are the loudest footsteps that I have ever captured on audio. 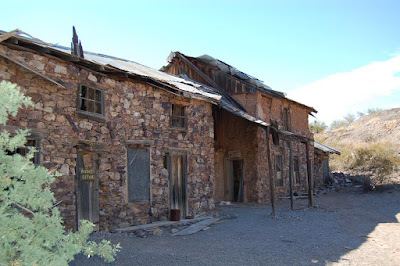 I conducted numerous investigations of this building as well as the surrounding structures. The old schoolhouse was built in circa 1880’s then abandoned for a newer structure next door in 1931. I had never captured one piece of paranormal evidence in the schoolhouse even though other investigators had. But on this very warm day in late afternoon in March, I was totally not expecting this to happen. I do remember the area became very quiet about three minutes into my EVP session. I was practicing with my new Sony ICD recorder and thinking about the class I was about to teach when loud footsteps walked past me on my left side and out the back door. I saw nothing. Thinking that this might be a hoax, I ran outside and looked at the torn tin roof and saw that no one was hiding on top of it. 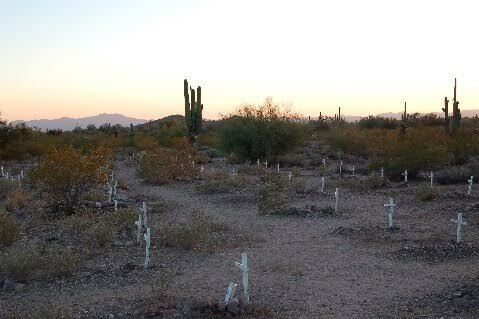 I then searched the desert bushes around the small schoolhouse and to my shock and surprise there was no one out there. The building had no doors or intact windows so if anyone had tried to run away I would have heard them on the rocky desert floor. 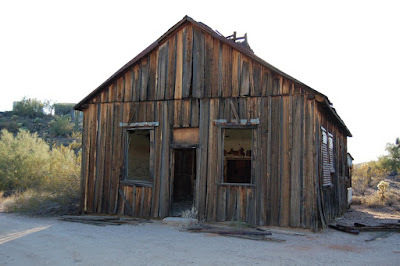 Later on that night I went back into the schoolhouse with a group of 10 students from the class. I was teaching them how to conduct a controlled EVP session and there was a full moon shining in through the back door on that calm, warm evening. Just before ending the class, I noticed a figure of a person stick their head through the doorway and look to the left before vanishing. It reminded me of a scene from the movie “Predator” when the monster turned on its cloaking device. In other words, I saw the outline of a humanoid figure without features and I could see right through it. I then asked the class if anyone had seen a figure in the doorway. The person next to me asked, “Did it turn its head to the left?” When I replied “Yes” the schoolhouse emptied! Was it a trick of the light in the full moon? Perhaps. But, remembering that footsteps episode earlier in the afternoon, I will always wonder if that was some sort of apparitional being. Dr. Barrie Colvin has been researching paranormal knocks and banging noises from poltergeist cases. He noticed that patterns from knocking sounds believed to be paranormal were acoustically shaped differently compared to human caused knocking. Click on the link below to read his research. Months later I was approached by a person claiming to have been a former Navy sonar operator who explained that he was also doing research in the same vein as Dr. Colvin. I sent him my audio clip from the Vulture Mine schoolhouse and he said that the acoustical patterns were abnormal compared to what they should have looked like. He stated that this is why he was sure my paranormal experience had not been faked. This is the kind of information that the paranormal community needs to continue to look into. If this research is accurate and paranormal knocking or banging noises do not convey the common properties as normal sounds in our environment, an important question remains: do disembodied sounds originate from deep within the structure that you experience on an investigation? This research could back up the theory that paranormal sounds or voices can be imprinted in a building or a home and that is why some of these active locations stay haunted when this type of paranormal activity is triggered in real time. If this is true, then what triggers it? The second audio clip (below) once again comes from our most haunted house. There were just two of us in the home the entire night. I was watching the investigator sitting on the couch in the DVR camera monitor in the back bedroom with the door closed when I suddenly saw him quickly move his head to the left and then to the right. A few minutes later he walked in to the back bedroom where I was and I noticed a change in his behavior. I asked him if he was alright and he said nothing. It was not until the end of the investigation when he told me that a very loud sound echoed through the front of the house after he asked a question. I could not hear it due to the very loud DVR unit buzzing away right in front of me when I was in the back of the house watching him in the camera. What I can only describe as a loud moan or groan filled the house and was captured on multiple recorders and heard by the investigator at the same time. It’s a prime example of the difference of disembodied phenomena compared to EVP. Which is the better evidence to capture? 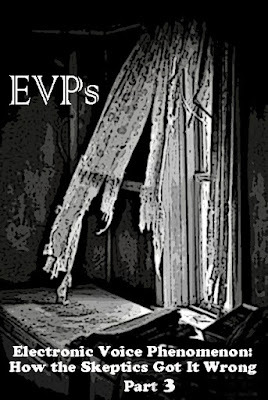 EVP or disembodied phenomena? Are disembodied sounds and voices (ones you hear with your ears) a partial materialization of some type of spectral being? Heard but not seen? A precursor to a full-bodied ghostly figure or apparition? It has to be considered better evidence since it displays itself in real time compared to an EVP that is imprinted. The study of disembodied sound and EVP must be looked at differently but share one common thread.